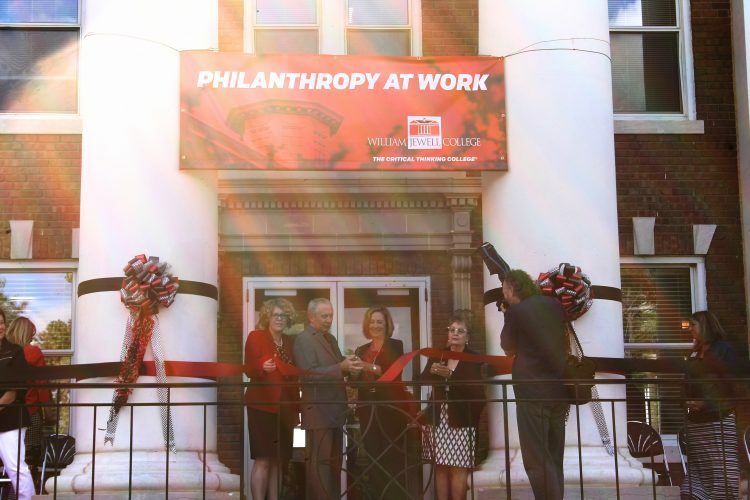 After a lengthy period of renovation, William Jewell College’s iconic Ely Hall has been reopened to students and renamed “Mathes Hall” to honor the contribution of the Mathes family. The rejuvenated dorm building was officially unveiled by college President, Dr. Elizabeth MacLeod Walls at a ribbon cutting ceremony Aug. 17 and will be home to approximately 100 first-year students this year. The building was closed for the entire 2017 to 2018 academic year to facilitate renovations and minimize the impact the construction would have on students. During that time a comprehensive remodeling was completed in all of the living spaces and communal areas. These changes occurred shortly after the dorm’s restrooms, shower facilities and lighting systems were renovated in the summer of 2016. Design and construction was carried out by Gould Evans Architects and McCownGordon Construction, as well as Jewell’s own facilities team. Donors included the Mathes Family, Shirley J. Pryor and the Sunderland Foundation. Though the final cost of the project is unknown, the renovations were expected to cost around $3.5 million. MacLeod Walls noted the necessity of this dorm remodel. College President, Dr. MacLeod Walls cuts the ribbon outside of Mathes Hall alongside donors Mark Mathes, Karen Rahter Mathes and Shirley J. Pryor at the unveiling ceremony on Aug. 17. In addition to the updates to existing features, students can look forward to many new amenities. Sydney Cotton, resident director of Mathes Hall, noted what she believes students have to look forward to while living in this newly renovated space. “The renovation of the residence hall included several aspects first-years can look forward to, including updated lounges that are comfortable and help promote community, brand new room furniture that does not require tools to loft beds and several study areas,” said Cotton. In addition to the communal living spaces and new furniture, the entire interior of the building was redone, including carpet, drywall, paint and LED lighting. Several former residents and resident assistants of Ely Hall were involved in the planning and design aspect of the new dorm. These individuals represented the student perspective in the redesign process. Student input was particularly valued when evaluating what aspects of the building to preserve and what additions to include. Those students included on the design team were Seki Anderson, Jacob Dice, Jeremy Hofman, Jesse Lundervold, Margaret Miles, Dalton Nelson, Spencer Ruwe, Macy Tush, Micah Williams and Elliott Yoakum. Many staff members were included in the design decision making. Those staff members were Stephany Guest in facilities; Susan Tideman, Susan Arbo and Clark Morris from advancement; Nathan Wyman from theatre and Ernie Stufflebean from residence life. Though the name of the dorm has been changed to Mathes Hall, students need not worry about the Ely name being forgotten on campus. Ernie Stufflebean, associate dean of students and director of residence life, assured The Hilltop Monitor reporters that the Ely name will live on. “The name Lewis B. Ely has been synonymous with Jewell campus housing since the first residence hall [was] built in 1880. The original Ely Hall stood on the north side of Jewell Hall, which is now the open Quad between Jewell and Gano. [What is] now Mathes Hall, was named Ely when it first opened in 1910. The namesake continues as Ely Commons, the new name for the entire first-year residential complex,” said Stufflebean. Spencer Ruwe, junior music performance, nonprofit leadership and applied critical thought and inquiry student, as well as resident assistant in Mathes Hall, added what he is most excited about for the new year in Mathes.